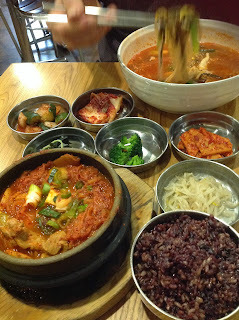 This humble meal of Korean kimchi stew at Berkeley's Spoon is my recent afterwork favorite. Kimchi being a fermented food is in various stages of ripeness and hence the stew or jigae made from it can only be slightly different each time. I prefer mine quite stinky, sour, and past the point of ripe but restauarants tend to serve them rather young. It takes much time and space to have your kimchi ferment. Now that I've adopted away our chickens, I could bury the urns full of kimchi in the back yard as my grandmother used to do. I rarely have kimchi at home as storing kimchi in your fridge ruins your house. Kimchi exudes a garlic odor so pungent no amount of cleansing will wipe away that happy smell. Not much to report on the tea front. My kettle chronicles however continue well into 2014. After I returned from Baja, I noticed my beloved electric kettle was missing and an unexpected box from Amazon it it's place. We had let some dear friends stay during our absence and somehow someone had mistakenly(??!??) heated the plastic-bottomed kettle on a gas stove. I had never imagined such a sad end for a faithful contraption which heated a gallon of water daily for over 14 years. I'm back to boiling water on the stove as no amount of research has turned up a worthy alternative. I took an old friend from Hong Kong to Berkeley's Ippuku which goes beyond a yakitori joint. 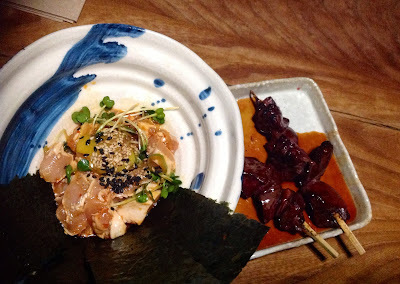 One of their more novel dishes is a chicken tartare served with a raw quail egg on top. Who's afraid of raw chicken sushi? Even as a Korean- raw chicken flesh is something I've never properly had. I've only enjoyed raw chicken skin and heart with sesame oil as a child. I've been putting off this particular delicacy for quite a while now only because I couldn't get anyone to share it and I didn't want to have to eat an entire bowlful by myself. The flesh is quite sweet and tastes like sushi. It turns out my friend somehow managed to evade this special experience without me noticing. I think once is enough for me as I find their raw scallops or uni to be a tastier treat. We also enjoyed grilled beef tongue, chicken heart, chicken liver and pig intestines with numerous cups of soba/buckwheat tea. I might toast my own buckwheat groats at home and start drinking more soba tea as it's nutty and healthful. 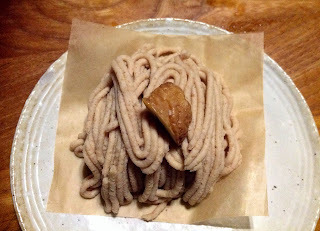 Chestnut creme noodles was their seasonal dessert. 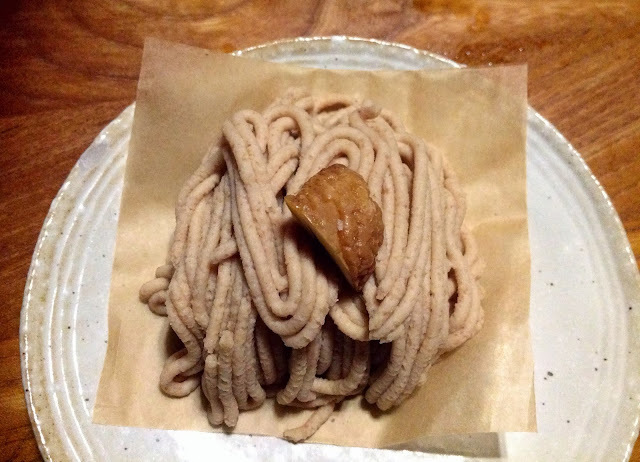 A visual pun on soba, this piece of deliciousness also hid a dollop of creme and spongecake inside. Ippuku means to take a break and so this meal gave us a definite respite from the endless taco and ceviche parade in Mexico but I'm ready to go back to topopos and salsa. I've been busily chasing sea critters up and down the Sea of Cortez since the new year. 2014 will be the year of the horse- a time for wild wanderings and adventure. I thought I would get the earliest possible start in Baja California- a land filled with remote corners accessible only by boat. There is no tea culture there as cold beer appears to be the drink of choice and I routinely swilled bagged tea in the mornings to get the job done. I'm too blasted from the flight to write but please feel free to click on the image above to see my initial photos from the trip. 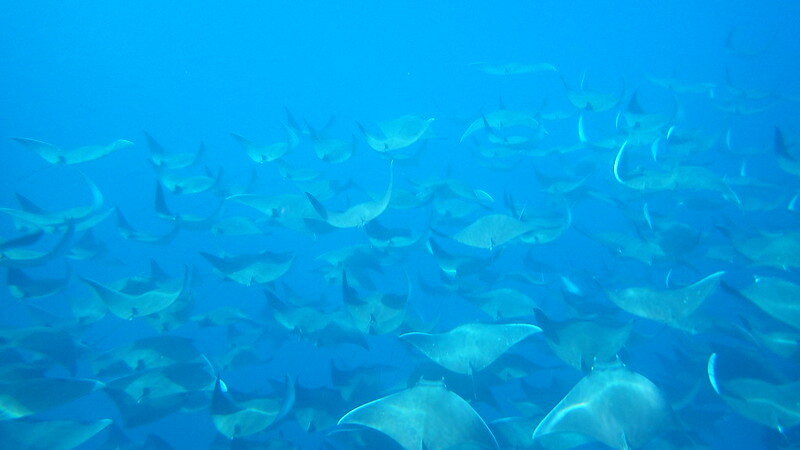 The above are mobula rays who migrate through Cabo Pulmo during the winter. I had been quite mentally depleted on arrival but drifting above these lovely manta rays cured me.